Pete and Sue Turnbull enjoy standing in the cool shade of the ancient red and black beech and totara that dominates the pristine stand of remnant bush on their North Canterbury sheep and beef farm, 146 kilometres north of Christchurch. They share Mt Terako Station, their 1415 hectare predominantly medium hill country property, with kereru, eastern falcons, kea, kaka, robins, grey warblers and rifleman, not to mention the flocks of bellbirds that gorge on kowhai nectar and echo their gorgeous songs through the massive old trees on fine spring mornings. “We are fortunate here with birdsong. For us, the dawn chorus continues all day, and at a much higher volume than in most other places,” says Sue. Although they are fortunate, since they bought Mt Terako in 1994, they have also spent time and effort to improve the ecological values of their 391 hectare piece of bush. Previously, they farmed further south, in Amberley. In the early 90s they began looking for a larger property that reflected the love each has for New Zealand’s natural heritage. “We had both spent plenty of time in the mountains, me in Arthur’s Pass, Pete working in the high country. We looked at properties across the South Island. Because of this special part of the farm, we both knew Mt Terako was right for us. In our hearts, we both said: ‘we want this property,’” says Sue. 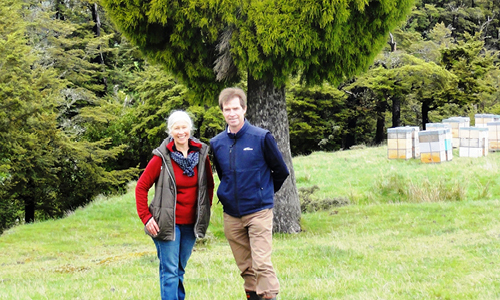 Although initially an inspiring, tranquil haven for the couple and their family, one of the largest intact ecosystems of its type remaining in Canterbury, and rising more than 1000 vertical metres through a range of different habitats, the property’s bush did compromise the farm’s viability, harbouring a large possum population, which affected the tuberculosis status of the Turnbulls’ Angus herd. “We needed to rid the bush of possums, primarily to improve the farm. Once we set off on that path, we quickly became equally motivated to do it for the health of the bush itself,” says Pete. In the first year they engaged a pest control contractor, who brought out 400 possum pelts. After that, Pete kept numbers to a minimum himself, using cyanide and traps. “We don’t see possums anymore. Although we still run traps, we catch very few. We are now trapping to see what’s happening as much as to knock back the numbers,” he says. Initially, cleaning up the bush was a big investment, with Pete spending four to five hours a week each winter poisoning and trapping, as well as Animal Health Board-funded poisoning operations. They also fenced the stand properly to keep the cattle out. It paid off, and in recent years the focus has shifted to rat, stoat and wasp control. “When we arrived, because the under storey had been grazed out, you could walk through any of that bush. Now you can’t. With the cattle kept out, and the possums down to a minimum, the under storey has thickened up in 20 years. It has been a huge improvement,” he says. With the possums gone, the Turnbulls have also made the cattle TB free, meaning the herd is off movement control. “That makes farming cattle much more flexible. Under the regulations, if you are on movement control, the only economic way to quit stock is to send them to the works. Once we came off movement control, we could sell them as stores. Instead of having to send them away after two winters, we can send them away after one. We have better flexibility, which is a big benefit, selling calves economically, where previously we had to take significant discounts. With no TB in the herd anymore, it’s a win-win all round,” says Pete. In 2016, the Turnbulls’ conservation ‘winwin’ received recognition, and permanent protection, from the highest level, when their stand of bush became New Zealand’s first granted a special new covenant. Bestowed on site by the Governor General, with the then Minister of Conservation also attending, the Mt Terako stand was the first recipient of the Queen’s Commonwealth Canopy initiative, which aims to protect indigenous forest around the world, under the joint auspices of the government and the QEII National Trust. Pete and Sue’s daughter Anna had a trip to Buckingham Palace as part of the initiative’s 50 country international launch. Having done their share to enhance and protect this special piece of New Zealand, the Turnbulls are now ready to move on, and have brought in Peter Crean of PGG Wrightson Real Estate to sell Mt Terako Station for them. “Mt Terako Station is an easily accessible tract of rarely available South Island medium high country, boasting outstanding scenery and a pastoral farming operation. “In addition to the farm, which produces well from carefully maintained pasture, historically focusing mainly on breeding, the covenanted area of native bush and scree presents ecotourism opportunities. Other recreational pursuits could include hunting, mountain biking and horse riding on the property itself. “This is one of Canterbury’s most aesthetically pleasing freehold high country farms. Close to Mt Lyford ski field and on the scenic route from Christchurch to Kaikoura, it boasts a modern, 15-year-old permanent material brick home, constructed on the old homestead site and therefore set among sprawling lawns and established gardens, with breath taking views to the mountains,” says Peter Crean. Mt Terako Station is for sale by deadline private treaty, with offers to be lodged by 5 December. 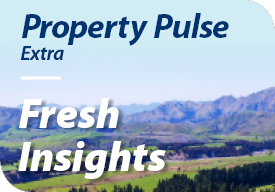 Read more articles from our Property Pulse Extra here.